Yes, Ivys, since there's a couple of them. Comic book characters do, indeed, change over time. Though it may seem that they don't, they certainly grow and change, gaining and losing powers, joining and leaving teams, acquiring and leaving love interests. The World's Finest set will show off some of these characters in different stages through their comic career. 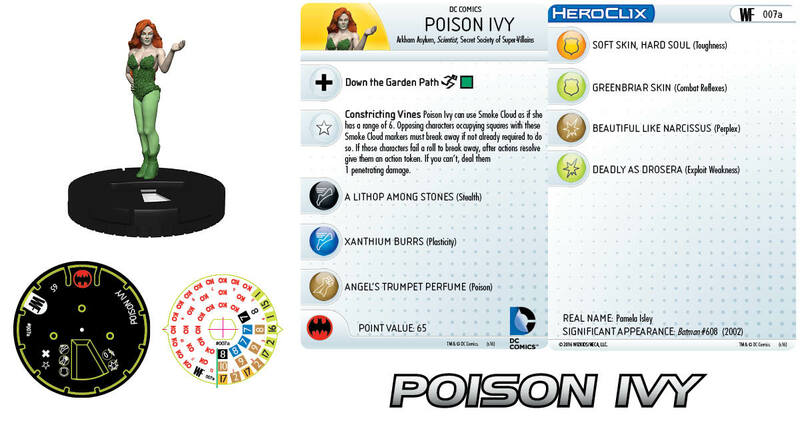 The one they're focusing on today is Poison Ivy. Depending on what aspects of Poison Ivy they feel like emphasizing at the time, she certainly can have a couple different power sets. In one case, she's very good at causing all sorts of hindering terrain and limiting enemy movement as vines suddenly spring up out of nowhere to entangle foes. But through the use of various poisons and other chemicals, she's also very good at more-direct manipulation, enthralling her enemies to do her bidding for her. In both cases, she can certainly be a deadly adversary, and as such, a valuable addition to your HeroClix teams.